The sticker we got at the Blue Jays says Toronto and below it is a Blue Jays J Jay logo. The lack of thought towards accessibility should have been obvious from the start, but it did not really set in until we were shown were our seats actually were. The parking garage located on one side of the Rogers Centre had only one handicap spot available when we got there (not sure if they had any more as they are marked on the ground and totally unrecognizable when parked in). We were then informed that they do not have an elevator and we had to walk up the car ramp that goes in and out of the garage. Not too bad, but it is quite a hill, and they did at least actively tell us where to park without us asking where the handicap spots were and also right away told us how to get out of the garage. Out of the parking garage we ended up at the hotel corner of the Rogers Centre. From there we could not walk to the right because there were stairs. Thus we went to the left up a ramp to try to get to Gate 7, which was the entrance gate marked on our ticket. We again ended up at steps outside Gate 3 and thus could not get to Gate 7. However, Gate 3 is a handicap entrance only and the elevators are right there, so that worked out. Going into the game we had no problem with the elevators, as it was not a general public entrance. At the end of the game, however, as usual one group of elevators were filled before we got on and we almost did not get on that one because a pushy guy with a kid in a stroller tried to get in front of Mik, but Dad was aggressive back and we squished into that load. When we got up to the 100 level we easily found section 112, where we originally had tickets. However, the handicap seats were nowhere to be found. We asked an usher and she showed us to the concourse and pointed to here are your seats and began to set out two chairs right there on the concourse. There are no markings or anything, but this is what the Canadian $9 handicap seats are. It was basically just as bad as at Dodger Stadium, but at least not so expensive. However, the real issue is that they have a fence of vertical bars right in front (see example in above photos) making it impossible for someone seated (i.e. in a wheelchair) to see the game except by leaning forward and peering through the cracks. Basically they are standing room type seats and you actually need to stand to see the game. Right away we decided this was not going to work and went to see if we could upgrade. Later we found this seating area was full of a wheelchair group along with being crowded with people standing. The seats we actually ended up with were in section 120. They are also on the concourse, but they are set apart and actually have the seats number and such. The seats were located right behind home plate and were about as good as the Cubs tickets, but for a crap team like the Blue Jays who do not even come anywhere near filling up their stadium it is sad that we were forced to pay Canadian $49 per ticket just to see the game from a wheelchair section. The guy said they have some in the upper section, but they are supposedly worse just because they are all the way at the top. However, they looked better than the tickets we originally had and would have been better than feeling ripped off and being upsold to these seats. Sitting in section 120 was not horrible, but it also was not worth the price. First of all they are the most expensive seats at the game and the same price as those right on the field in that section, so it is kind of a rip off that you cannot pay that much and actually be right up by the field with a wheelchair. The view was great with the whole field visible and the bar in front not getting in the way of viewing the game. I thought the glass panel above the bar might be an issue, but it was not and unless you really zoom in on the photos you probably will not even notice that half the photo of the whole field is being viewed through the glass. Mik, of course, was disappointed in there being no cup holders, but he was not mad because the regular section also lacked them. The biggest issue, however, was that there was a lot of people standing behind the section making it a maze to get out of the seats and onto the concourse to get stuff. Of further annoyance was that the fans frequently did not pay attention to the yellow line and crowded oue section including a man that kept getting food and drinks for his kids in the row below us and passing it down to them by almost coming right in front of us, which blocked the view of first base and the outfield. This is something that could easily be fixed if they had a rope behind every part of the handicap section, as our part was the only one that lacked that, or at least put an usher there. Overall I was very disappointed at the experience at the Rogers Centre. It was not as bad as Dodger Stadium, as the overall atmosphere was not quite as bad as at the Dodger game and the ushers we did encounter were friendly here. It is, however, the worst accessible park we have been to so far. It is also entirely unacceptable because it is a fairly new park. The thing that really gets me is they have the nerve to sell those Canadian $9 wheelchair seats that are impossible to see the game from. I will never again go here with Mik and actually sit in the Rogers Centre. So how would I do it instead? Well, the Rogers Centre is quite unique. It has a hotel and a Hard Rock Café in it that do not offer access to the rest of the Centre (i.e. team shop, concourses, concessions, the field). The hotel and Hard Rock do however offer great outfield views of the game. One possibility is to get a table at the Hard Rock Café right up against the windows that overlook the park and watch the game that way. However, I do not really like the Hard Rock, so that would be sort of a waste of money like the $49 seats are. The hotel option sounds like it could be great, as it would just like having a suite. Mik thought it would be cool because he could watch television or do something else if he was not into the game. It might not be a cheap hotel, but that would certainly be a worth it type expense for an accessible way of enjoying the game. Finding an interesting baseball at the Blue Jays was hard. There were plenty of designs to choose from, but none really stood out besides the Canada Day one. I did not want to get that one, though, because we did not actually go to the Canada Day game (July 1). I was about to choose a ball of the field that came with a tin, but it was expensive and had a rather generic seeming photo that could have easily been any outfield. Then I finally found the Toronto Skyline one buried in the bins of balls. The Toronto Skyline one has a light blue silhouette view of the Toronto skyline on a darker blue background. On one end of the skyline it has stamps that say Toronto Ontario 2009 and American League. On the other end of the skyline it has a stamp design with the Rogers Centre. The other strip of the ball is silver and on one end it has a Jays logo and the other end says Toronto. At the Rogers Centre Mik choose a natural colored mini bat. The mini bat has a design with the Blue Jays logo and also the Blue Jays mascot on it. The first thing Mik tried at the Rogers Centre was Sour Patch Kids. Yeah, they are basically the same as in the United States, but they are distributed by a different company and actually do seem a little different. At first Mik thought they were not as sour, but it was only because all the sour had ended up on his hand from holding it too long. In the end he actually thought they were sourer because they seem a little thinner. Mik did not end up with any of his own food at the Rogers Centre, as he filled up on donuts from Tim Horton’s on the way to the game. He was going to try the gyro, but not when he learned it was made with chicken and not the normal beef. He was also disappointed to not find any regular fries anywhere. He did, however, try the sweet potato fries I got. He did not like them, though. He did enjoy the part he tried of the three cheese pannini I had. After going to the Canadian Baseball Hall of Fame we stopped at a Farm Produce shop right outside of St. Mary’s, Ontario, where the Hall of Fame is located. The shop mostly had preserves, but they also had fresh baked items and fresh strawberries. We got a jar of Pumpkin Apple Butter and Blueberry Rhubarb Jam, as well as a thing of strawberries. The strawberries were a great snack as we drove to Toronto and after dinner that night at the campground. We have not tried the Blueberry Rhubarb Jam yet, but the Pumpkin Apple Butter is pretty good, although it just tastes like apples and nothing like pumpkin. Mik was excited at the Canadian Baseball Hall of Fame that for once he got a mini bat and I was not able to get a baseball. They usually seemed to have baseballs, but with Induction Weekend having been the week before they were out of a lot of things they normally had in stock. They did still have some 2009 Canadian Baseball Hall of Fame Induction mini bats, though. The 2009 Canadian Hall of Fame Induction mini bats are two colored with natural coloring on top and a reddish brown color on the bottom. One of the interesting things about this bat is that it is made by KR3, which is a Canadian bat manufacturer, rather than Louisville Slugger or Cooperstown Sports like most of the other mini bats in his collection. The mini bat has a small logo of the Canadian Hall of Fame. It says 2009 Induction June 20, 2009 and has the names of the four inductees this year (Roy “Doc” Miller, Bernie Soulliere, Larry Walker, and Ernie Whitt). At the Herschell Carrousel Factory Museum we got a bumper sticker that says I Rode the Carrousel in North Tonawanda, NY. The sticker also has two carrousel horses and says Herschell Carrousel Factory Museum. Dad put it in the top left corner of the back window. 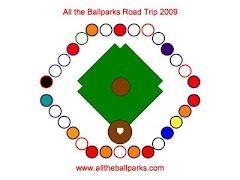 We went to the Canadian Baseball Hall of Fame back on June 26, 2009, on our way to the campground in the Toronto area. Well, it was not exactly on the way, as the distance from it to the campground was about the same as the distance from Niagara Falls to the campground and it took three hours to get there from Niagara Falls. Anyways it was a very worthwhile detour and the only baseball thing that was enjoyable in Canada. In fact it was an even better overall experience, although there was not as many things to look at, than the National Baseball Hall of Fame in Cooperstown, New York. The Canadian Baseball Hall of Fame is really small. The Cincinnati Reds Hall of Fame at Great American Ballpark is actually at least twice as big as the Canadian one and that one is just about one team. It is about the same size as the part of the San Diego Hall of Champions devoted to baseball, but that is just for one city and not one country. It is not that the museum does not have enough stuff to make a bigger museum, as they way they are they have quite a lot crowded on display, but just that baseball is not that big of a thing in Canada and they do not have the resources to have a larger exhibit space. The Canadian Baseball Hall of Fame is located inside a house tucked back in a mostly residential area of the small town of St. Mary’s in Ontario, Canada. The house is adapted to have a ramp up to it, so it is just as accessible as a regular museum building. It is a little cramped inside, but only because they have so much they want to display at one time (by the way they try to rotate what is on display regularly) and have such limited space. It may be to the point of almost cluttered, but there was still adequate space for Mik to go through it. Also, the bathroom is very accessible, as it is the original one from when it was just a residential house with the tub removed. For such a small museum it is amazingly accessible and part of why it was so disappointing to see the lack of consideration for wheelchair in the Rogers Centre accessible seating rows. There are only two rooms in the museum, but there is plenty of interesting things to discover. One of the things that caught Mik’s attention was an old pitching machine, which had an interesting sign about how a similar one was actually used as the pitcher in a college baseball game once. Other things included some Babe Ruth memorabilia and info on his connection to Canada, such as hitting his first professional home run in Toronto. There was also some Jackie Robinson things, as he played for the Montreal Royals Minor League team before debuting in the Majors. Induction Weekend was the weekend before we visited, so they had some exhibits on this year’s inductees, such as Ernie Whitt and Larry Walker. They also had some other recent memorabilia, such as things from the Canadian team playing in the Beijing 2008 Olympics and the ’09 World Baseball Classic. Overall the Canadian Baseball Hall of Fame was a lot of fun to visit. There was a good amount of items to see and it was interesting to the Canadian connection to MLB, which has increasingly become almost exclusively in the United States, but used to have more of its teams (i.e. Montreal Expos) and Minor League teams in Canada. Also, the one employee there was very knowledgeable not only about the things in the museum, but also Canadian baseball history and general baseball history as well. It was so nice after visiting places like the Theodore Roosevelt Inaugural Site that had people that barely knew the script for showing the site to have a person that knew a lot about the place and also had passion about it. By the way I was impressed from the start when I noticed a little sign about the history of the house the museum is located in.